(via NASCAR Wire Service) FONTANA, Calif. – NASCAR has another Bicentennial Man. Kyle Busch picked up his 200th career NASCAR national series victory by virtue of his win in Sundayâ€™s Monster Energy NASCAR Cup Series race at Auto Club Speedway, the same track where he notched his first career Monster Energy Series victory in 2005. His 200-win mark in NASCARâ€™s national series equals that of Richard Petty, who won 200 races in NASCARâ€™s premier series. The win is the Joe Gibbs Racing driverâ€™s 53rd in the series. Busch also has piled up 94 wins in the NASCAR Xfinity Series and another 53 in NASCAR Gander Outdoors Truck Series Series competition. The Las Vegas native notched his first of 200 victories in 2004 at Richmond Raceway in what is now the Xfinity Series, starting from the pole and leading 236 laps in the No. 5 Hendrick Motorsports Chevrolet. Win No. 2 wasnâ€™t too far behind, as Busch led 93 laps a Charlotte Motor Speedway two weeks later for his second victory. 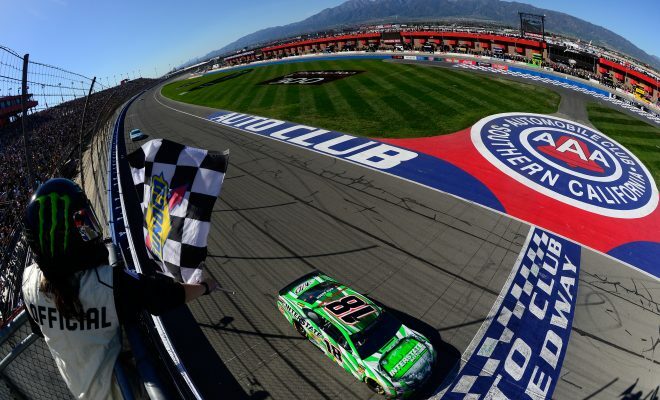 NASCARâ€™s 2015 Monster Energy Series champion added his first victory in the premier series in 2005 at Auto Club Speedway, leading 95 laps after starting 25th to take the checkered flag and celebrate for the first time at the sportâ€™s highest level. Earlier that year, Busch picked up his first Gander Outdoors Truck Series win at Charlotte, followed up a week later by another trip to Victory Lane at Dover. Busch has won at least one Monster Energy Series race in every season since 2005 and only missed out on scoring victories in the other two series during that time frame in 2012. Heâ€™s also the 2009 Xfinity Series champion. Seven-time Cup Series champion Richard Petty also has 200 career national series wins, all of which came at the premier series level. The comparisons between the two milestones was inevitable, but one that even Busch himself doesnâ€™t consider parallel. Now that Busch has crossed No. 200 off his list â€” and heâ€™s still just 33 years old â€” whatâ€™s next on his agenda?